Did you see David and Tamela Mann (aka two of our favorite power couple Seconds) on Good Morning America recently? They sat down with GMA anchor Robin Roberts to talk about how their faith has impacted their 25 years of marriage and the key to a healthy argument (spoiler alert: it basically comes down to just one word). Real talk on how to build strong communication in relationships from an award-winning comedian and a gospel legend? Yes, please. GMA: "You both have similar upbringings – humble beginnings, very devoted mothers, absent fathers – and you didn't know you would have the [life and marriage] that you grew to have...so how did all of that come about?" Tamela: "It's really our faith. Our faith base has really helped us to survive. And the struggles that we had made us work even harder for our kids. We wanted to do better. And the marriages that we saw – we wanted to do better with that." 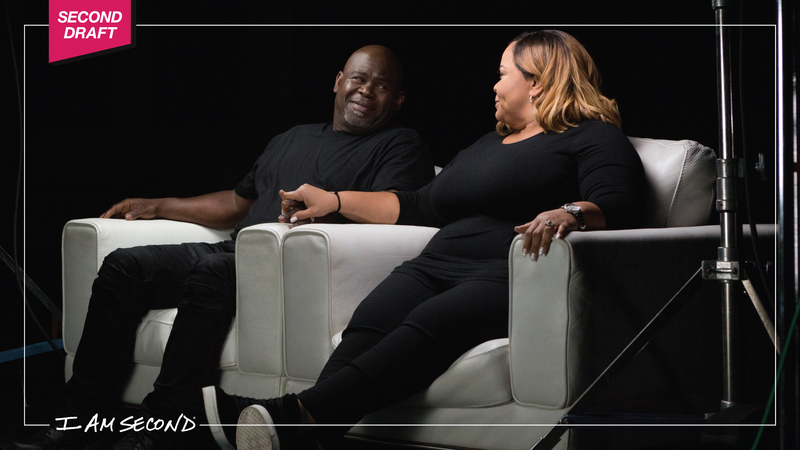 When David and Tamela filmed with I Am Second in 2018, it couldn't have been more clear how passionate they are about building their relationship on the foundation of their faith, and that commitment is evident to everyone around them. In the foreward to the Mann's new book, Us Against the World, filmmaker and playwright Tyler Perry wrote: "I know [David and Tamela's] marriage hasn't been easy. They've had to endure a lot of trials. Through it all, they put God first. They hold a powerful, abiding faith. And that's why their marriage is profoundly beautiful, strong, solid and innocent. It exemplifies the fruits of the Spirit." GMA: "How do you go about – as a married couple – trying to have a healthy argument?" Tamela: "We've learned to stick to the issue...you want to get understanding." David: "A lot of time we argue to make sure you know my point – to make sure I'm right – but it should be to make sure you get an understanding. We never make the argument bigger than our marriage, or make the situation bigger than us because a lot of times stuff can grow and get out of hand." We love this advice because, like life, it's both simple and complex. It's simple in that it can be summed up in a single word: Understanding. And yet, learning to live, love and communicate in a way that prioritizes true understanding is difficult. It takes hard work, humility and an overwhelming amount of grace, which is also an echoing theme for the Manns in Us Against the World: "It's amazing what's possible when two people are willing to do the work. Joy-filled marriages don't happen because we wish for them...They happen when friendship is the foundation, when faith is your bedrock, and when fun is an absolute non-negotiable." Seriously, who thinks in addition to their television, music, and book-writing careers, David and Tamela should consider a weekly advice column? Want more of the Manns? You can watch David and Tamela's full film with I Am Second as well as some additional behind-the-scenes footage here.